The only thing I would have changed about this year’s gag is have a video of a flying asteroid decimating starship after starship in Galactic Starfighter matches. What did you think of this year’s April Fools’ Day gag? Here is the dev post by Courtney Woods and a link the article posted on the SWTOR website. 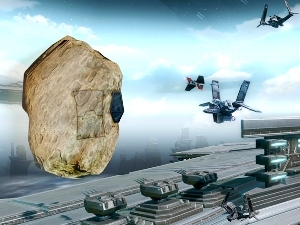 Disguise yourself as part of the battlefield with Galactic Starfighter’s newest ship role: The Asteroid! The first subscriber reward associated with the Galactic Stronghold announcement has been given out. All those qualifying subscribers by April 2nd, 2014 were award 500 Cartel Coins. This may not seem like much, but that is exactly what a 6 month reoccurring subscription is awarded. As a subscriber myself, I am very appreciative for BioWare giving us even more Cartel Coins. I’m not sure what to do with mine. Use them on the new Cartel packs or save them when Galactic Strongholds expansion is released. How would you spend these awarded Cartel Coins? One thing you might consider doing with those 500 extra Cartel Coins is using them during Friday’s Hourly Cartel Market sale. It is going on now, April 4th, 2014 from 9 AM – 12 AM CDT. 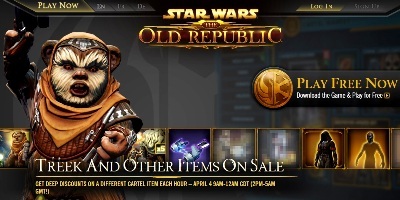 So be sure to login and check the Cartel Market every hour for the next item at the sale price. I am all in favor of the sale, but I think the timing is wrong. It should be all day Saturday, when more people are home and able to login. Below are a few possible items and times from Dulfy’s site. These are some best guesses at the items and times. BioWare has announced the dates, times and locations for two more Community Cantina events. The next one on the calendar will be happening in Boston, MA. According to the post on the SWTOR website, the Boston event will be on Friday, April 11th, 2014 at 8PM EDT. Below you can see the location, address and times for the Boston Cantina event. 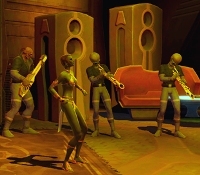 The other event announced on the SWTOR website, will be the Community Cantina event in Vancouver, British Columbia, Canada. This event will take place Friday, May 16th, 2014 at 8PM PDT. Below you can see the exact location, address and times for the Community Cantina. If you are near either of these two Community Cantina events I would strongly suggest attending. 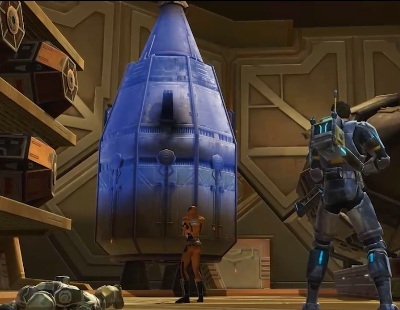 Besides a great way to meet members of the community and development teams, it also gives you a chance to interact with many players from SWTOR and not to mention every attendee will receive one of the codes for the new Astromech pet, M8-3R. You may remember back when we ran our last double XP weekend that there were a lot of forum reports around that Kuat Drive Yards was not issuing double XP. Once we realized that, as a “make good” to the issue, we would do another double XP weekend so you can all reap that sweet, sweet double XP in KDY. Well I am here to give you some good news, our “make good” double XP weekend will be next weekend, from April 11th – April 13th. – KDY is actually awarding double XP and there is some confusion around how much XP players should be receiving. – KDY is experiencing issues when awarding double XP, but for some unknown reason it is only manifesting on the live servers (outside our testing areas). – Resolved an issue that prevented Flashpoint group members from getting experience if grouped with someone outside of the listed level range of the Flashpoint. Now, defeating level-appropriate enemies will grant experience regardless of group. – Resolved an issue where enemy levels were being incorrectly colored as green instead of grey, to indicate that no XP would be gained from killing them. Next, I thought it would be good to explain a bit about experience gains during double XP. If a player is playing a flashpoint when they have rested experience, they will be earning double experience from all mob kills. Meaning if you play mainly within rested XP, a double XP weekend may not appear to have any affect at all. Here are some examples of experience gains at levels 15, 30, and 50 in KDY. This is a lengthy post by Eric Musco, and in fact there is more to the post and I would suggest you go to the dev post to read the rest of the post along with some math in the spoiler boxes. The math helps to illustrate how the XP is being handled in Kuat Drive Yards depending on level range. Of course the primary purpose of this post is to inform everyone that something still is not working with Kuat Drive Yards and Double XP. There are basically two scenarios that Eric illustrates in this post. One is that the way XP is handed out for KDY appears that Double XP is not working or the second scenario that Double XP is just not working in KDY for whatever reason on live servers. SWTOR has another Double XP weekend coming up April 11th – 13th. Eric is asking everyone jump into KDY next weekend to see what your results with Double XP and its impact on this Tactical Flashpoint. With everyone submitting their data this may help uncover what is happening with Kuat Drive Yards during Double XP weekends. Please make sure you understand that this is not a vote. Even if there is a consensus on a specific idea that everyone wants that is no guarantee that we will develop it. Also there is no guarantee that we will develop an idea that is suggested. We want to gather ideas on what you want from the next warzone so we can make something ya’ll want! Alex Modny started this thread as the Warzone team was beginning to brainstorm ideas for the next Warzone. The team is asking the community what are some ideas they might have for the next Warzone. In the above post, Alex explains what they are looking for from posts…basically the more information the better. I have read several ideas already posted in this thread and there are some really creative styles and gameplays for Warzones being submitted by the community. I’m not a huge PVPer, but some of these ideas would have me giving them a try. Do you have a creative idea for a new type of Warzone or maybe a different type of gameplay to a current Warzone? If so, you need to write out your idea with as much detail as possible and then submit it to this thread. This week’s video is by YouTube user JC20Productions. 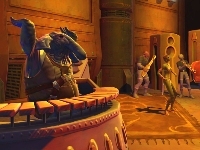 It is a music video set to the song, “I Need Your Love.” Now, although the title of this song may not translate into a SWTOR music video, it actually does work. The video itself is an overview of the many different story elements, Flashpoints, Operations etc. It is basically a video slideshow through SWTOR. Like I said earlier the song, despite its title, actually pulls the video together the electronic sounds in the music just seems to work. Take a couple moments to watch the video and let us know what you think of the video. Please leave your thoughts in the comment section below. If you have created a video about your adventures in SWTOR let us know by emailing a link to corellianrun@gmail.com or jason@corellianrun.com.